Propagators provide the perfect start in life for your seedlings and cuttings. The clear lid allows light in whilst helping to maintain a warm and humid atmosphere, incubating your plants during their crucial early stages of root development. 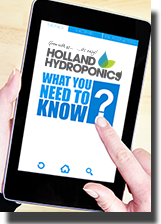 Holland Hydroponics supply heated and unheated propagators available in various sizes complete with adjustable air vents. Unheated propagators are a cost effective way to help create a warm humid environment that’s ideal for rooting out clones and germinating seeds, as long as the room, or tent, it’s used in already has warm or high ambient temperatures. Propagators are the ideal solution when to comes to germinating seeds and rooting clones, as they provide a closed environment creating warmth and humidity to improve seed germination root growth. 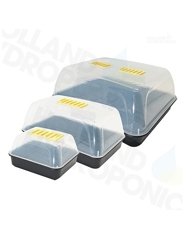 Looking for an X-Stream lid for your Propagator take a look at this lid. Warm your roots to the ideal temperature. Perfect for catching the run off liquids from plant pots. The Flexi Trays are perfect for when you’re struggling to fit a regular tray in your grow tent or small room. The flexible and lightweight nature of these trays mean you can transport them easily and set them up in tight spaces with limited access.